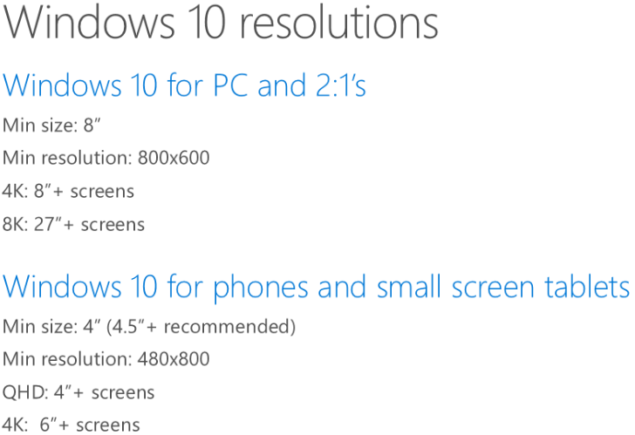 Windows 10 will support screen resolutions up to 8K (7680×4320). 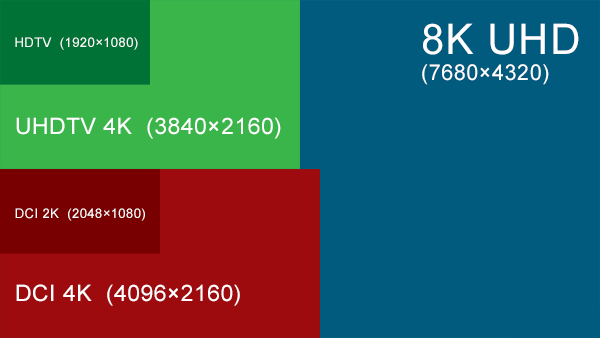 Even though prototype 8K TVs have been shown for the last couple of years, commercial release of 8k displays is probably for at least one or two more years. During the WinHEC conference last week, Microsoft revealed minimum and maximum resolutions that will be supported in Windows 10, according to PC World. Windows 10 will offer support for 6″+ phone and tablet screens 4K (3840×2160) resolution, 8″+ PC displays with up to 4K resolution and 27″ + monitors with 8K (7680×4320) resolution. You can view Microsoft’s slide here. Researchers from NHK (Nippon Hōsō Kyōkai, Japan Broadcasting Corp.) believe that 8K ultra-high-definition television format is the final 2D format as it is the highest 2D resolution that the human eye can process. Therefore 8K and similar resolutions will be around for a very long time. 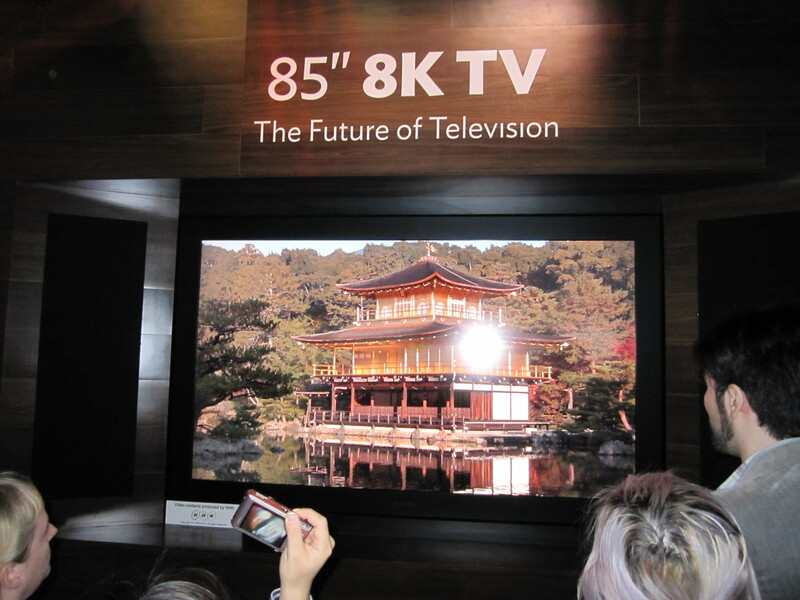 NHK is already testing broadcasting in 8K ultra-high-definition resolutions, VESA has ratified DisplayPort and embedded DisplayPort standards to connect monitors with up to 8K resolution to graphics adapters and a number of upcoming games will be equipped for textures for 8K UHD displays. Microsoft has been criticized for poor support for 4K UHD resolutions in Windows 8 so having Windows 10 supporting 8K so early in its lifecycle, it could prove beneficial to both users and Microsoft. 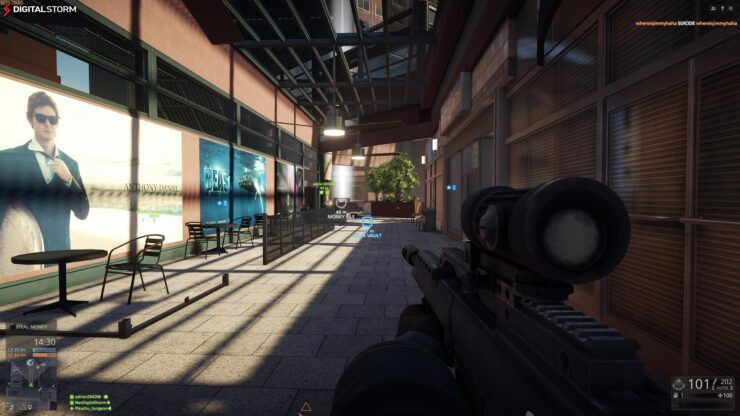 PC has become the most dominant gaming platform, and with the availability of 8k, gamers will be able to jump right in, without waiting for a new OS to support the new resolution. 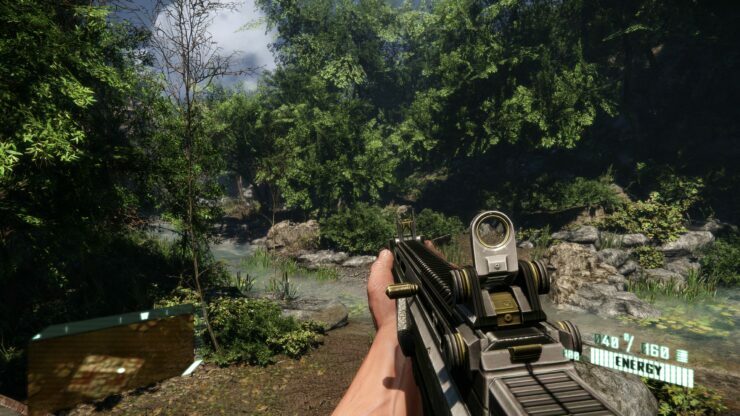 With the recent GTX Titan X by Nvidia, single GPU 4K gaming has become feasible, so it should be possible for Nvidia and AMD to have single or dual GPU solutions ready for 8K not too far in the future. It could take a few years for 8K to become practical, so Microsoft has prepared Windows 10 to be optimal for 4K. It akso supports the 4K video codec HEVC (High Efficiency Video Coding), also called with H.265, which is being promoted by the International Telecommunications Union. The OS will support 4K resolutions on PCs with screen sizes of 8 inches or higher, and on small-screen tablets and smartphones with screen sizes of 6 inches and higher, according to the slide from the presentation. Microsoft Windows 10 will be available this summer in 190 countries on 111 languages.